The 2012-2013 Football Season is coming to a close. Whether your team made it to the big bowl or sadly missed the winning record, you can still celebrate the end of the season. 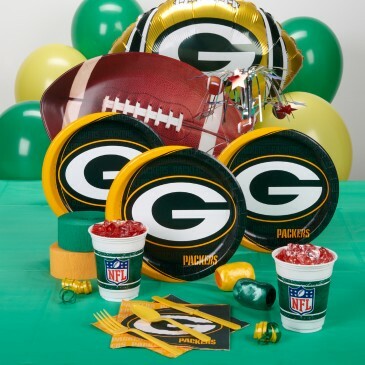 That's why this Super Bowl week, our family is celebrating our Green Bay Packer pride with a Green Bay Packer party pack from Birthday Express. Birthday Express offers a wide variety of party packs that can fulfill any party theme. In our house, we are football fanatics, specifically Packer fans. While other families will be breaking out the Super Bowl plates Sunday night, we will be eating from Packer plates. Why? Because we are celebrating another great Packer season. . A true fan supports her team even if they lost in the playoffs. Birthday Express offers a wide variety of football related party supplies throughout the entire calendar year. Football celebrations aren't limited to the boys of fall. You can have a party in during the spring or grab the pigskin goodies out by the pool. Don't be confused. Birthday Express has a huge selection of your favorite characters, themes and colors to make any celebration a festive one. From Angry Birds to Disney Princesses, your next kid's party will be the fully coordinated from plates to goodie bags. Even if you don't have a particular theme picked, pursue the website for some inspiration. Don't be overwhelmed planning your next big celebration. Head to Birthday Express and get all the supplies to make your party memorable.